What’s the verdict on the new Spicks and Specks? I actually didn’t expect to enjoy this as much as I did. 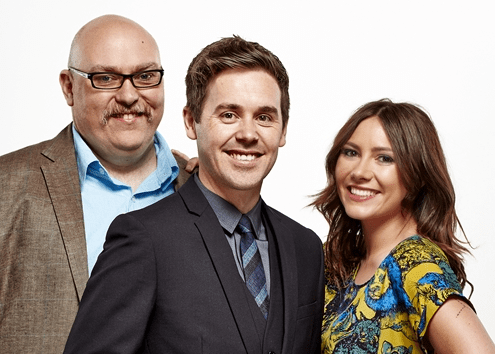 The show returns 8:30pm Wednesday 5 February on ABC1. Jennome it isn’t due to clashing. Another irony is they promoted it during the end credits of QI. Squishing the credits and what is a more heinous crime: muting the music. So they promote a music show that claims to love music by getting rid of the music of another show. That makes sense in some sort of universe. I guess it’s the uncaring universe. My problem is I actually care about the shows. Including how they are either treated or mistreated. It can make me a loyal viewer. But also a breakable one. A. why would you not watch it on account of QI? They’re both on the same channel, so will hardly clash. I agree with Sydney2k and everyone else that think that it is perfectly reasonable to for them to do this show with new people. I will admit I don’t plan on watching the first show due to QI. But I might one day watch it. The main concern I have is will they screw over the music of the end credits. Because wouldn’t that be sad and ironic as well as typical that a show that celebrates music has its own music stuffed about with. Maybe they could get live musicians to play the end theme tune to prevent such nasty practices. I’m looking forward to this. Love watching American talk shows get passed on to another host. We don’t do it enough here. I cant wait! I loved the show before, and I’m sure I’ll love it again! Hopefully Apple won’t try to censor the title this time when they put the episodes on iTunes. I subscribe to Spicks on Facebook and I remember receiving a post saying that “S****s and Specks” was now on iTunes. Many of us asked the ABC why this unintelligible nonsense was being given as the title. We were told that the PC filters in the US had censored the title because the word “spicks” is apparently an ethnic slur in the US. The ABC appealed to Apple to allow the proper title to be used because this is Australia and the show is Australian and Apple complied. I remember when I mentioned the title of the show on a US messageboard in the early Noughties I received numerous abusive replies accusing me of being a racist. I responded by saying that the title came from a Bee Gees song in the 1960s and had nothing to do with ethnic politics or Yankee political correctness. Yes I recall filing this story some time ago. Hillsy tells the story with some mirth. To be fair though, Adam, Alan and Myf were the embodiment of S&S. No one could conceive anyone else being the show. So, for S&S Mk1, yes, Adam, Alan and Myf did go out on a high. But this is S&S Mk2- a whole new ball game. So no, I disagree. Had it been the old crew getting back together again, you might call it a mockery- but not with a whole new line up.